Oliver Robertson, PRI’s death penalty and alternatives project manager, was in Africa from late June to meet with our partners Foundation for Human Rights Initiative in Uganda and to attend a Continental Conference in Benin on death penalty abolition in Africa. The death penalty is often handed down in situations where trial procedures are certainly unfair and even chaotic. In both countries, he met people who had experienced wrongful conviction and spent years on death row awaiting execution. When I tell people I work on death penalty abolition, the response is usually one of two types: “Wow, that’s really interesting!” or “Wow, that’s really hard!” But when they say the latter, I have to reply that it’s not, really. Not only do I not work on individual cases, I don’t even (for the most part) work directly with most of the people we are trying to help or influence, be that people on death row, prison guards or MPs. Most of my days are spent reading, writing and project administration. All important for helping PRI meet its goals, but quite divorced from what our project documents call ‘final beneficiaries’: the people facing death, their families and those around them. Perhaps this makes it even more powerful when I do meet such people. In recent weeks, I have heard from five. The last was Edmary Mpagi, who was sentenced to death in Uganda in 1982 for murder, then ultimately released 18 years later when the supposed victim was found alive. 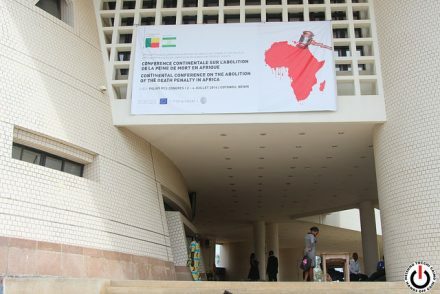 Edmary spoke of his experience at the opening of the Continental Conference on the Abolition of the Death Penalty in Africa, held from 2-4 July in Benin. He spoke of the impact of friends he made in prison being executed, of the loss and fear it caused: ‘Knowing you’ll face death is very damaging’. Perhaps the hardest loss, he said, was his brother, who had been jailed for the same offence, dying on death row due to lack of proper medical treatment. Many factors of his case were depressingly familiar to those working in penal reform: he was assigned a case lawyer he only met when he arrived in court and who relied on police notes to prepare his case; the prosecution presented no physical evidence, instead relying solely on (false) witness testimony; and an inadequately detailed and substantive appeal. More bizarrely, the alleged deceased actually attended the trial for a time. One of the impacts of Edmary’s imprisonment was on his children. They stopped going to school because they could no longer afford the fees after their father was jailed. But some other children in the same situation now have a source of support in the form of the NGO Wells of Hope. This charity supports children of prisoners in Uganda, by housing and schooling them, taking them to prison to visit their parents (otherwise impossible for many children due to the cost and distance) and tracing children for parents who are in prison. Currently, they have around 60 primary school age children at the Wells of Hope academy, where they receive an education without having to hide their situation of being a prisoner’s child. Three of the children whose fathers are on death row spoke about their situation, in particular how traumatising the arrest was. Arrests are often violent and children sometimes think that their parent has been killed at or after being arrested; they also want to be recognised and helped by the authorities. The final and longest account was from Patrick Zizinga, a Ugandan man who spent twelve years on death row. Like Edmary Mpagi, he was initially charged with the murder of someone (his wife) who was still alive, and when the victim was changed to his alleged girlfriend, her family protested that they did not know Patrick and that he was not the killer. However, despite this he was convicted and not released until a mitigation hearing in 2013, for which he was supported by PRI’s partner organisation FHRI, at which the presiding judge found the flaws in the case sufficiently serious to release him immediately. What was most powerful about Patrick’s testimony was hearing about the enduring impact: getting out of jail has not meant that he is free from all its negative, baleful influences. Since his conviction, Patrick has suffered from powerful headaches and stomach problems that have continued to this day and are controlled with powerful painkillers. It was when he was re-reading the original judgement, he said, that he came across the judge’s final words: ‘Go and suffer this’, and realised that this was the point at which the pains began. He still gets disturbed by the sound of clinking keys and has nightmares over a year after being released. And he came out of prison with no money and no land. While he was in prison, his family was ‘torn apart’: Patrick’s son ran out of school after he could no longer cope with being persecuted by his own teacher, while one of his daughters married aged 13. However, there have been (some) positive impacts: Patrick states that he may well be dead now had he not been imprisoned, as the initial allegations came from neighbours who wanted his land. He has also become the first person in the world to study for an LLB law degree from the University of London while on death row. He is now acting as an advocate, not only for his own case (he has not had his conviction quashed and is working to have the Supreme Court overturn the judgement) but also for others and the iniquity of death row. Much of his testimony was delivered at a meeting lobbying Parliamentarians about a Bill to reduce various prison sentences. His case, he says, is ‘a bit unique’, but not completely. ‘There are so many convicts like me: innocent but still in prison’.